I definitely want to begin this discussion on a high note. I’ve been a fan of Palladium’s books since the 80’s—my friends and I would play the /crap/ out of games like Rifts, TMNT, and Robotech through the early 90’s as often as possible. The newest book for any of those lines caused my gaming group in junior high and high school to instantly get together for a discussion of its highs and lows and how best to work it into our campaigns. I was a very lively and memorable Rifts campaign during my years in the military as well. I’ve lost count of the number of Rifts and Robotech characters I created, the adventures and campaigns we enjoyed. Through the decades, I’ve culled my book collection many, many times… but Palladium’s books have stayed on my shelf. Heroes Unlimited, Ninjas and Superspies, and even the weapon compendiums published by Palladium have spent time amongst my collection, and there’s quite a few books (which I intend to talk about later at length) that I read and re-read over and over. Just to give you, gentle reader, an idea of the depth of my appreciation for Palladium’s overall line of work, I intend to write future blog posts that are reviews of individual books (starting with Century Station for Heroes Unlimited), overviews of lines as a whole (definitely for Rifts) and discuss other lines under my already-established series (such as King for a Day). 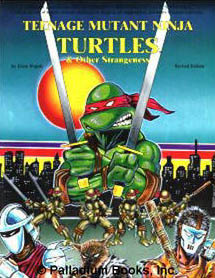 The bottom line is that Rifts, TMNT, and Robotech are three /pillars/ of my early roleplaying game development as a player, a GM, and a designer. I would be completely remiss in writing this post about the company without acknowledging that up front. Palladium’s book lines have changed a lot over the years, but there’s always been some standouts. For me, those are three lines in particular: Rifts, Robotech, and TMNT. A future blog post is going to cover this game system in much more depth. 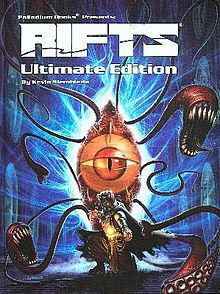 For the purposes of this post, I’ll simply say that Rifts is a beautiful, gonzo sci-fi setting with tons of stuff from any and every other genre you can think of. This amazing setting is unfortunately tied to an outdated, clunky mess of an RPG system. That having been said, I love playing it and will continue to do so at nearly every opportunity. I will unhesitatingly point to TMNT as a guide to “how to do a licensed RPG right.” The original creators of TMNT, Kevin Eastman and Peter Laird, pitch in to add a special comic strip just for the core book for this line. Every bit of it feels like it was designed to help you create your own adventures in their world. Although Palladium no longer makes TMNT (and it is essentially dead as one of their product lines), I consider it to be one of the defining features of their company. I have a strained love affair with Robotech—on the one hand, I love the show (although it is very dated by modern animation standards), I love the mecha, I love the characters, I love the style. On the other hand, there’s things about it that really bother me, and among them is the RPG. 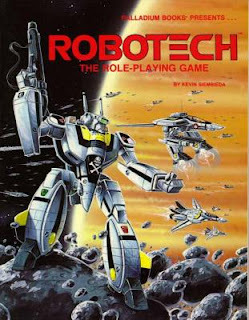 Almost a polar opposite to TMNT, the Robotech RPG is basically just a bunch of stats and pictures of ships and characters with very little tying it all together or any attempt to really make it feel like the show. And, when it came out, I frickin’ loved it. My original copy of the Robotech RPG is dog-eared from constant reading and reference. We played the hell out of this game, even if it wasn’t much of a game, because it was cool. Kevin Long’s artwork had a lot to do with that, along with the obsessively-detailed stats for each type of mecha and the (albeit scant and underdeveloped) information about the show and the storyline. Again, this is a topic I intend to revisit in the future. I don’t have much to say about the other Palladium product lines, other than I generally find them at least somewhat interesting. I hear a lot of good things about Palladium Fantasy, for example. So this post turned out to be quite long, and I decided to split it up into multiple posts. The next installment in this series is going to take a hard look at Palladium’s history, business practices, and ways of dealing with freelancers and fans alike. I should warn you, gentle reader, that much of what I have to say is less thancomplimentary—this is why I wanted to start things out by telling you all about the things I enjoy and admire about the company before digging into everything else. So stay tuned for more coming up in part 2!